So I’ve been trading $HD from basically the bottom of the handle based on an IBD alert. 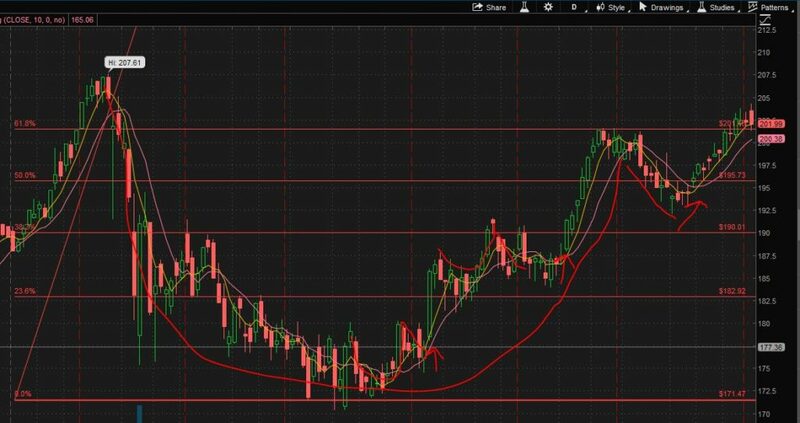 The cup and handle pattern has proven, to me at least, to be a reliable and easy to read pattern that is awesome for swinging. You really know where to put your stops and can expect a decent run from the pattern. The following criteria is based on Bulkowski’s The Pattern Site (http://www.thepatternsite.com/cup.html). Price trend Upward leading to the pattern. Price should rise by at least 30% leading to the cup. Handle duration 1 week minimum but usually lasts 1 to 2 weeks. Cup Cup rims should be near the same price level. So let’s analyze $HD in this regard. The cup is the one place where I do not see the rims of the cup being at the same price. Typically, the right side rim is lower, but within a close margin of, the left rim. IBD also agrees with this logic but Bulkowski wrote the book on patterns so I won’t argue with him either. What I found most interesting after reading Bulkowski’s analysis on the pattern is the fact there are often cups within the cup. This is definitely true for $HD and there were a couple small but powerful breakouts that occurred inside the cup which presented good trading opportunities! They are highlighted below, see what you think. As far as my progress, I am up over 80% on HD calls that I still have a few weeks left on. I’ll hold a few more days to wait on the breakout but if not I’ll roll these to longer expirations. My price target is 220.